In this SAP Press book chapter excerpt, learn about the importance of the business model concept for SAP business process management (BPM) users. Discover what goes into a business model framework. about the importance of the business model concept for SAP business process management (BPM) users. You'll also discover the components of a business model framework. With the components development, logic and value became key words in the literature on business models. In recent years IBM Global Services and the IBV (IBM Center for Business Value) have developed an innovative business model approach that includes business model design, business model innovation, and business model transformation. The IBM business model approach is called the Component Business Model (CBM). This was the first time somebody not only used a general method to identify core competencies (resources and capabilities), partner networks, value proposition, customer segments, and relationships, and thereby cost and revenue, but used a logical representation and technique to map the enterprise on a single page. This CBM approach can be used to analyze the alignment of enterprise strategy with the organization’s capabilities and investments, identify redundant or overlapping business competencies/capabilities, analyze sourcing options for the different components (buy or build), prioritize transformation options, and create a unified roadmap after mergers or acquisitions. 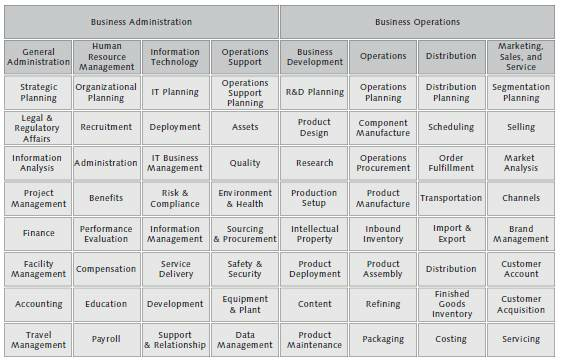 The model is organized as business components along columns and “operational levels” along rows. Business components are defined as large business areas with characteristic skills, resources, processes, and competencies. The three operational levels (depending on industry) are planning, monitoring, and execution. They separate strategic decisions (planning), management checks (monitoring), and business actions (execution) on business components. This new approach to business modeling took the concept of the business model to a higher and more strategic level. A split began to form between business model approaches, where many of the business modeling approaches continue to focus on functional component requirements without paying sufficient attention to the other nonfunctional issues. The result is a final product that is unsatisfactory and fails to comply with the strategic business objectives of its users. Therefore, the perspective of business model innovation and transformation is not jointly unified. 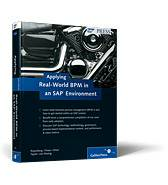 This excerpt from Applying Real-World BPM in an SAP Environment by Ann Rosenberg, Mark von Rosing, Greg Chase, Rukhshaan Omar, and James Taylor is reprinted here with permission from SAP Press, copyright 2011. Download a PDF of this chapter. 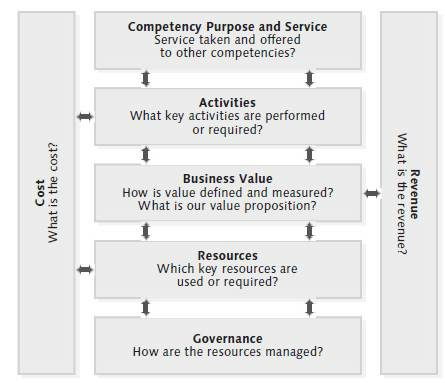 The other development approaches focused on resources (assets), capabilities, and thereby competencies, which are combined competencies, which a company needs to plan, create, and realize value, in both an effective and efficient way (see Figure 1.6). In order to plan, create, and realize value in an effective and efficient way, a company should identify the key value drivers of innovation (see Chapter 3), which should yield rewards rather than extra cost in building such competencies. Understanding which processes and initiatives it takes to design, innovate, and transform one’s business competencies to match the vision and strategy that is needed should not only help a company gain cost improvement, but differentiate advantage as well. Both can be more broadly approached or narrowed to be more specific, which results in the third viable competitive strategy: focus. A competitive advantage exists when the firm is able to deliver the same competencies and benefits as its competitors, but at a lower cost (cost advantage), or deliver competencies that exceed those of a competing organization (differentiation advantage). Thus, a competitive advantage enables the organization to create superior competencies, and in this manner value, for its customers and superior profits for itself. Cost and differentiation advantages are known as positional advantages since they describe the firm’s position in the industry as a leader in either cost or differentiation. However, contrary to the rationalization of Porter, contemporary research from Kim Chang in 1997, 1998, and 1999 has shown evidence of firms practicing a successful mixture of low cost and differentiation strategy. Research literature by Prajogo [Pajogo, 2007] state that firms employing the hybrid business strategy (low cost and differentiation strategy) outperform the ones adopting a single generic strategy. Sharing the same view point, Charles Hill argues in his paper, “Corporate strategy and Firm Performance,” that a successful combination of these two strategies will result in a long-term competitive advantage. As an example, combining these two strategies in one’s competencies is successful, when combining a market segmentation strategy with a product differentiation strategy is an effective way of matching your firm’s product strategy (supply side) to the characteristics of your target market segments (demand side). However, combinations such as cost leadership and differentiation in one’s competencies are hard (but not impossible) to implement, due to the potential for conflict between cost minimization and the additional cost of value-added differentiation. To achieve a competitive advantage, the firm must perform one or more valuecreating competency activities in a way that creates more overall value than do competitors. Superior value is created and realized through lower costs or superior benefits to the consumer (differentiation). In this case a company needs to define on a high level how competitive advantage is created. After the strategies of cost and differentiation leadership are chosen, many writers [Robert M. Dibrell; C. Clay; Kim, Eonsoo Nam; Daeil, Allen; R. Helms, M. Takeda; M. White C.; Stimpert, J.L.] argue that specific and multiple business strategies need to be specified and applied in order for companies to carry out the chosen strategies. According to the resource-based view [Wernerfelt, B., Hoopes, D.G. ; Madsen, T.L. ; Walker, G], in order to develop different underlying competitive advantage strategies that supports cost advantage and differentiation advantage, the firm must apply the strategies to the resources and capabilities, and in doing so the competencies of the company. 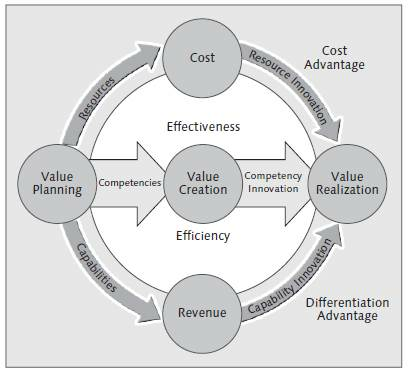 As illustrated in Figure 1.6, both resources (assets) and capabilities, which are combined competencies, need to be innovated in order to create and realize value, both in an effective and efficient way. Without applying a cost and/or differentiation approach to one’s competencies, the competitors simply could replicate what the organization is doing and any advantage could quickly disappear. Let’s go into the details of each of the capability/resource innovation elements in the competency – value model. We will start with resources. As important as resources/assets are, it usually takes more than resources and assets to offer value to customers. One such additional value is a firm’s capabilities. Capabilities refer to the firm’s ability to utilize its resources efficiently. A capability is the capacity for a set of resources to interactively perform a stretch task or an activity. Through continued use, capabilities become stronger and more difficult for competitors to understand and imitate. As a source of competitive advantage, a capability should be neither so simple that it is highly imitable, nor so complex that it defies internal steering and control [Schoemaker and Amit, 1994]. As shown in Figure 1.6, capabilities are associated with revenue potential for the most part; therefore capability innovation should lead to any form of differentiation that would give the company a differentiated advantage. The active planning, creation, and realization of such competencies strengthens the firm’s brand, reputation, enables innovation, meets customer sustainability needs, builds employee relations, productivity, efficiency, quality, all of which can be leveraged to create a cost advantage or a differentiation advantage. We can conclude that since the goal of a business model is to make money, a task that must interest an organization is the pursuit of a business model. Therefore, the firm’s attention must focus on the types of capabilities and resource/assets that are most likely to develop the critical core competencies the organization needs to create and realize the planned value, in order to ensure that the business model is profitable. Furthermore, a firm must acknowledge which capabilities and resource/assets are non-core competencies that most likely to ensure low cost, e.g. standardization and automation, which the organization’s business model needs in order to be competitive and profitable. A firm needs to have the ability to convert its resources and assets into competencies that create value (internal and external). Customers will not scramble to a firm’s doors simply because the firm has modern resources and assets such as plants, geniuses, and patents. The firm has to use the plants, the geniuses, and the knowledge embodied in the patents to offer customers something they value. Patients do not buy patents or skilled scientists from pharmaceutical companies; they buy medicines that have been developed by skilled scientists using knowledge embodied in patents. Assets must be converted into something that customers want. A firm’s ability or capacity to turn its resources into customer value and profits is usually called a competence or competencies. Competences usually involve the use or integration of an organization’s capabilities and resources/assets. Logic’s ability to quickly turn its “cores” into products that customers want is a competence, which can be either core or non-core competencies. Intel’s ability to develop microprocessors that exploit its copyrighted mircrocode and that are compatible with its installed base of microprocessors is a core differentiating competence. So is Coca-Cola’s ability to turn its secret formula and brand into a product that many customers perceive as being preferable to its rivals’ products [Afuah, 2003.]. Because the goal of a business model is to make money, a question that must interest an organization is: What types of capabilities and resource/assets are most likely to develop the critical core competencies the organization needs to create and realize the planned value and to ensure that the business model is profitable? As we have discussed, business models are vital for business design, innovation, and transformation. But putting business innovation and transformation into practice with the right operating model requires executives to think differently, not only about the construct of the organization but also about the interrelationships of the assets they rely on to provide value to their customers. Business models offer a proven approach to driving a critical core competencies focus, both internally and externally. Internally, competencies help organizations rethink the leverage they can achieve with the assets and capabilities they own. Externally, competencies help organizations source specialized abilities they cannot feasibly create themselves. Combining these types of business innovation and transformation allows organizations to redefine their competitive positions in the face of the sweeping changes in their industries while simultaneously achieving the competing benefits of scale, flexibility, and efficiency. In Figure 1.7 we see an example of a general business model with its business competencies, which are the modular building blocks that make up a business model. 1. The competency purpose and service — the logical reason for the competency’s existence within the organization, as defined by the service, and thereby value it provides to other competencies. 2. Each competency conducts a mutually exclusive set of activities to achieve its business purpose and thereby create value. This is where processes are interconnected. 3. To create value, competencies require resources — the people, knowledge, and assets that support their activities and processes. 4. Each competency consists of capabilities that use different resources, and therefore company assets. 5. Each competency is managed as an independent entity, based on its own governance model to ensure performance and value realization. 6. The different competencies each have a cost that can be either measured, optimized, or developed, depending on whether it is a core or non-core competency. A ground rule here is that cost reduction should for the most part only be done within non-core competencies. It is important that when determining the boundaries of the competencies, you consider the various dimensions, not just one or two, even though one or two might be the drivers, for cost cutting, value creation, and/or governance. All of the competencies are highly collaborative, working with other competencies both inside and outside the company. Collaboration is accomplished through the exchange of services, activities, and inputs and outputs for all competencies. When a competency requires an input to complete a particular activity, it procures it as a service from another competency. That way it can access the full range of inputs it requires. This competency will in turn provide an output that other competencies can use as their input. Predefined service-level agreements — covering such aspects as formatting, timing, quantity, quality, payment, and provisioning — set the standards for all of these transactions Business competencies derive much of their advantage from two related but distinct traits: The loose coupling of links between competencies provides flexibility, adaptability, and responsiveness, whereas the cohesion of activities within each competency provides efficiency and enhanced quality. Interaction and connection between competencies is characterized by flexible, loose, and free coupling. Instead of “hardwired” inflexible links based on proprietary or customized connections, competencies interface through clearly defined service boundaries, forming and breaking connections as they initiate and respond to service requests to each other. Flexible coupling also relies on a common sharing principle, so that even incompatible underlying systems can be joined based on competency value-added communication. This aspect of competency sharing and thereby development gives organizations much more scalability in the services they provide and use among each other and more flexibility in deciding whether to source a competency within the firm or outside it. In either case, the competency requesting an input in terms of service is indifferent to how that service is implemented. Please note that we are not talking about SOA services, but how competencies give value-added services to each other. From the process perspective this would be competency activities that are illustrated in a process model as value-added chain diagrams. Value-added chain diagrams are used to illustrate and identify those competency activities within the company that are directly involved in the creation of a company’s added value. These functions can be interlinked by creating a competency and function sequence and thus a value-added chain. Such a value-added chain diagram not only enables you to express a subordination of competency activities; it can also display the competency functions’ links to the business model and thereby the organizational units and information objects. From the outside a competency is a “black box” whose inner workings are irrelevant. The possibilities of developing business competencies and building on the value-added services they can share with each other is a great potential for value creation and realization within an organization (refer to Chapter 2). Internally, competencies deliver scale and efficiency gains through consistency, the union of similar competency activities from across the organization into a business competency group. To achieve cohesion, each competency activity must belong uniquely within one competency group, with no duplication within or between competencies (because they should share these competencies as described in Section 1.6.1). An added benefit of bringing these competency activities together in a business model competency group is to expose the relative performance discrepancies between competency activities and others that are not performing an thereby create high costs for executing the competency. In this area there are great possibilities for developing, optimizing, and innovating competency activities for cost cutting and value creation and realization within an organization (see Part III, Chapter 14, for more information). Business modeling provides a framework for organizing competencies by accountability level. By employing such a framework, executives can begin to envision how current business activities might function as an interlocking set of modules. 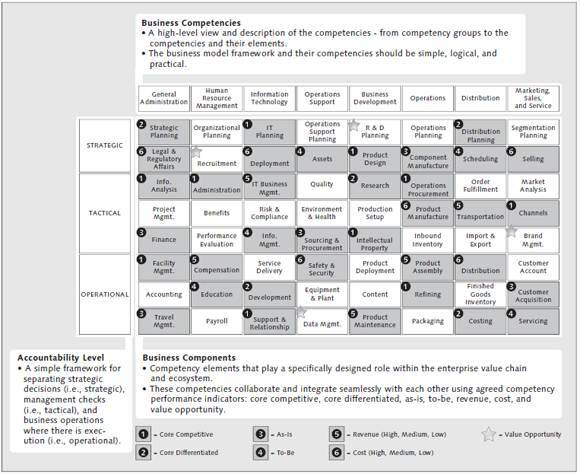 Categorizing activities by business competency yields a high-level view of competencies according to the type of value they provide to the enterprise. Different firms in different industries model their competencies differently, but in every case, each activity should line up under a particular competency. Examples of competencies are HR, operations, distribution, business development (see Figure 1.6 and Figure 1.7). value planning in the enterprise. These mid-tier competencies serve as control, monitoring, checks, and balances between the strategic and operational levels. They monitor performance, manage exceptions, and act as gatekeepers of assets and information. These tactical competencies provide the business actions that drive value planning, monitoring, and governance in the enterprise. 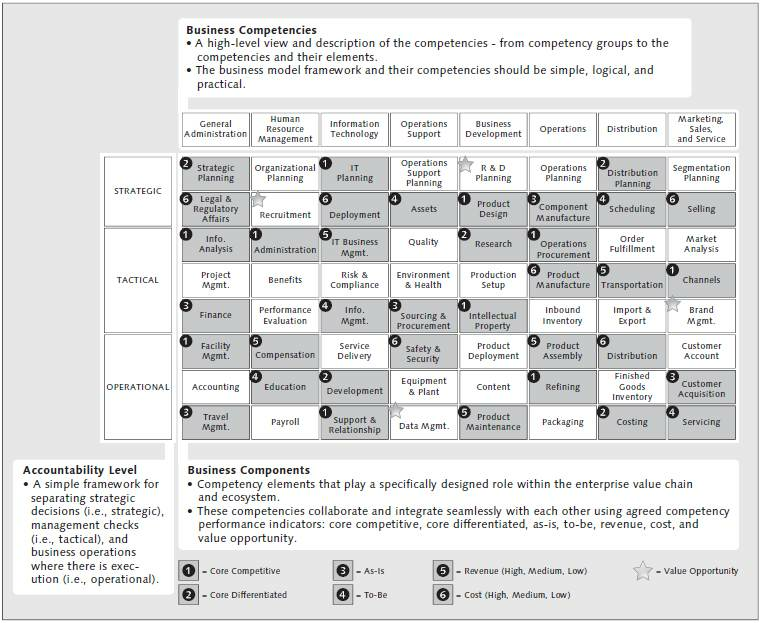 These low-level competencies provide the business actions that drive value identification and creation in the enterprise. They process assets and information for use by other competencies or the customer. The three accountability levels imply different priorities. At the operational level, for example, the emphasis is on keeping people fully occupied and productive. From a technology standpoint speed of data entry and real-time availability are important. Contrast this with activities related to the strategic tier, where such high-level activities as planning and launching new products are handled. This level houses a small number of people who have a very large impact on shareholder value. Launching a new product requires collaboration among several elements, including marketing, risk, finance, regulations, and credit. Input from all of these stakeholders is needed to make the launch a success, so workflow is a key requirement. From a technology standpoint, activities typically require people (resources) and capabilities to discern patterns and trends from rich, multidimensional data, usually stored in a data warehouse. Systems at the strategic level are not designed for speed of data entry, but rather for ease, breadth, and depth of analysis. Real-time interfaces are not needed, because data is often months old and processed in batches. To drive as much revenue, value creation, and realization as possible from business model competency development, only core competitive and core differentiated competencies across the firm are aggregated. It is an organization’s CCCs that enable an organization to outperform its rivals. These competencies with the attached seven dimensions should, when automated and supported with an IT system, be treated as own practice. Far too often such competencies are automated with the IT system’s Best Practices, and therefore their uniqueness and differentiation can potentially be destroyed. Whereas the IT system Best Practices are vital to cut costs, for example, fast implementation, fewer mistakes, standardization, and less risk, because it is proven to work, this can’t be applied in the area of CCCs that enable core competitive and core differentiated competencies. However, even if a firm offers the right customer value to the right market segments and does so better than its rivals, it is still possible that the firm might not be profitable. That is, superior relative customer value offered to the right customer segments, although necessary, is not always a sufficient condition for profitability. Therefore, the cost of making money is a vital ingredient for succeeding. Offering the right value to the right customer segments and being positioned advantageously vis-à-vis suppliers, customers, rivals, potential new entrants, and substitute products may still not be enough for a firm to capture the revenues that its positions suggest it should. To keep the cost low a company should standardize its NCCs and thereby apply IT system Best Practices to all NCCs and the attached main and supporting processes.